Julia Mary "Julie" Walters, CBE (born 22 February 1950) is an English actress and writer. She has won two BAFTA Film Awards, four BAFTA TV Awards and received the BAFTA Fellowship in 2014. Walters first came to international prominence in 1983, for playing the title role in Educating Rita. It was a role she had created on the West End stage and it earned her an Academy Award nomination for Best Actress. It also won her a BAFTA and a Golden Globe. She received a second Academy Award nomination, this time for Best Supporting Actress, for her role in the 2000 film Billy Elliot, which also won her a BAFTA. Her other film roles include Personal Services (1987), Prick Up Your Ears (1987), Buster (1988), Stepping Out (1991), Calendar Girls (2003), Mamma Mia! (2008) and Brave (2012). She has also played Molly Weasley in seven of the eight Harry Potter films (2001–2011). On stage, she won an Olivier Award for Best Actress for the 2001 production of All My Sons. On television, she is well known for her collaborations with the late Victoria Wood, having appeared with her in several television shows including Wood and Walters (1981), Victoria Wood As Seen on TV (1985–1987), Pat and Margaret (1994) and Dinnerladies (1998–2000). She has won the BAFTA TV Award for Best Actress four times, for My Beautiful Son (2001), Murder (2002), The Canterbury Tales (2003) and as Mo Mowlam in Mo (2010). She also starred in A Short Stay in Switzerland in 2009, which won her an International Emmy for Best Actress. In 2006, she came fourth in ITV's poll of the public's 50 Greatest TV stars in Britain. In 2008, she released her autobiography titled That's Another Story. Walters was born in St. Chad's Hospital, Edgbaston, Birmingham, which was then the main maternity hospital for Smethwick. Her parents, Mary Bridget (née O'Brien), an Irish Catholic postal clerk born in County Mayo, Ireland, and Thomas Walters, an English builder and decorator, lived at 69 Bishopton Road, near Lightwoods Park, in the Bearwood area of Smethwick. The youngest of five children and the third to survive birth, Walters had an early education at a convent school and later at Holly Lodge Grammar School for Girls on Holly Lane in Smethwick. "It was heaven when I went to an ordinary grammar school," she said in 2014, though she was asked to leave at the end of her lower sixth because of her "high jinks". In an interview with Alison Oddey, Walters said about her early schooling: "I was never going to be academic, so [my mother] suggested that I try teaching or nursing [...] I'd been asked to leave school, so I thought I'd better do it." Her first job was in insurance at the age of 15. At 18 she trained as a nurse at the Queen Elizabeth Hospital, Birmingham, and worked on the ophthalmic, casualty and coronary care wards during the 18 months she spent there. Walters decided to leave nursing, and studied English and drama at Manchester Polytechnic (now Manchester Metropolitan University). She worked for the Everyman Theatre Company in Liverpool in the mid-1970s, alongside several other notable performers: Bill Nighy, Pete Postlethwaite, Jonathan Pryce, Willy Russell and Alan Bleasdale. Walters first received notice as the occasional partner of comedian Victoria Wood, whom she had briefly met in Manchester. The two first worked together in the 1978 theatre revue In at the Death, followed by the television adaptation of Wood's play Talent. They went on to appear in their own Granada Television series, Wood and Walters, in 1982. They continued to perform together frequently over the years. The BAFTA-winning BBC follow-up, Victoria Wood As Seen on TV, featured one of Walters's best-known roles, Mrs Overall, in Wood's parodic soap opera, Acorn Antiques (she later appeared in the musical version, and received an Olivier Award nomination for her efforts). In 1985, she played Adrian Mole's mother Pauline in the TV adaptation of The Secret Diary of Adrian Mole. Walters appeared in the lead role of Cynthia Payne in the 1987 film Personal Services – a dramatic comedy about a British brothel owner. Then she played the lead character's wife, June, in the film Buster, released in 1988. She also appeared as Mrs. Peachum in the 1989 film version of The Threepenny Opera, which was renamed Mack the Knife for the screen. In 1991, Walters starred opposite Liza Minnelli in Stepping Out and had a one-off television special, Julie Walters and Friends, which featured writing contributions from Victoria Wood and Alan Bennett. In 1998 she starred as the Fairy Godmother in the ITV pantomime Jack and the Beanstalk, alongside actors Neil Morrissey, Adrian Edmondson, Paul Merton, Denise van Outen and Julian Clary. The show was first broadcast 25 December 1998 on ITV1 and continues to be shown every year around Christmas on ITV2. Walters has won numerous other acting awards, and was appointed officer of the Order of the British Empire (OBE) in 1999 and raised to commander level (CBE) in the 2008 New Year Honours for her services to drama. In 2001 she won a Laurence Olivier Award for her performance in Arthur Miller's All My Sons. She received her second Oscar nomination and won a BAFTA for her supporting role as the ballet teacher in Billy Elliot (2000). In 2002 she again won a BAFTA for her performance as Paul Reiser's mother in My Beautiful Son. Walters also played Molly Weasley in Harry Potter and the Philosopher's Stone (2001), Harry Potter and the Chamber of Secrets (2002), Harry Potter and the Prisoner of Azkaban (2004), Harry Potter and the Order of the Phoenix (2007), Harry Potter and the Half-Blood Prince (2009) and Harry Potter and the Deathly Hallows – Part 1 (2010) and Part 2 (2011) and got international success with it. Harry Potter and the Goblet of Fire is the only Harry Potter film to have not starred Walters. In 2003 Walters starred as a widow (Annie Clark) determined to make some good come out of her husband's death from cancer in Calendar Girls, which also starred Helen Mirren and Ciarán Hinds. In 2005 Walters again starred as an inspirational real-life figure, Marie Stubbs in the ITV1 drama Ahead of the Class. In 2006, she came fourth in ITV's poll of the public's 50 Greatest Stars, coming four places above frequent co-star Victoria Wood. Also in 2006, she starred in the film Driving Lessons alongside Rupert Grint (who played her son Ron in the Harry Potter series), and later had a leading role in the BBC's adaptation of Philip Pullman's novel The Ruby in the Smoke. In the summer of 2006, Walters published her first novel, Maggie's Tree. The novel, concerning a group of English actors in Manhattan and published by Weidenfeld & Nicolson, was described as "a disturbing and thought-provoking novel about mental torment and the often blackly comic, mixed-up ways we view ourselves and misread each other." Another reviewer described the novel as "the work of a writer who knows what she's doing. There's nothing tentative about the writing, and Walters brings her experiences as an actress to bear on the page. ... you do have the sensation of entering someone else's mind and of looking through someone else's eyes." Walters starred in Asda's Christmas 2007 TV advertising campaign. She also appeared alongside Patrick Stewart in UK Nintendo DS Brain Training television advertisements, and in a public information film about smoke alarms. In summer 2008, Walters appeared in the film version of Mamma Mia!, playing Rosie Mulligan, marking her second high-profile musical, after Acorn Antiques. In 2009 Walters received a star in the Birmingham Walk of Stars on Birmingham's Golden Mile, Broad Street. She said: "I am very honoured and happy that the people of Birmingham and the West Midlands want to include me in their Walk of Stars and I look forward to receiving my star. Birmingham and the West Midlands is where I'm from; these are my roots and in essence it has played a big part in making me the person I am today". Her other awards include an International Emmy with Ben Whishaw for A Short Stay in Switzerland. She also appeared as Petula Gordino in Wood's sitcom dinnerladies. In July 2012 Walters appeared in the BBC Two production The Hollow Crown as Mistress Quickly in Shakespeare's Henry IV, Parts I and II. In the summer of 2012, she voiced the Witch in Pixar's Brave (2012). In 2012 she worked with LV= to promote one of their life insurance products targeted at people over 50. Walters was seen in television advertisements, at the lv.com website and in other marketing material helping to raise awareness for life insurance. Walters appeared in The Last of the Haussmans at the Royal National Theatre in June 2012. The production was broadcast to cinemas around the world through the National Theatre Live programme. Walters also played the part of Cynthia Coffin in the ten-part British drama serial Indian Summers aired on Channel 4 in 2015. In 2015, she also appeared in the romantic drama film Brooklyn, a film that was nominated for the Academy Award for Best Picture. Walters' performance in the film earned her a nomination for the BAFTA Award for Best Actress in a Supporting Role. Walters voices the Lexi Decoder (LEXI) for Channel 4 during the 2016 Paralympic Games. The graphical system aims to aid the viewing experience of the games by debunking the often confusing classifications that govern Paralympic sport. Walters' relationship with Grant Roffey, an Automobile Association patrol man, began after a whirlwind romance. The couple have a daughter, Maisie Mae Roffey (born 26 April 1988, City of Westminster, London), but did not marry until 1997, 11 years into their relationship, when they went to New York City. The couple live on an organic farm run by Roffey near Plaistow, West Sussex. In August 2014 she featured in the first episode in the eleventh series of the BBC genealogy series Who Do You Think You Are?. The programme revealed that her maternal ancestors played an active part in the struggle for more rights for Irish tenant farmers, known as the 'Irish Land War', which started in 1879. Although not included in the programme, Walters' paternal grandfather, Thomas Walters, was a veteran of the Second Boer War. He was killed in action in World War I in June 1915, serving with the 2nd Battalion of the Royal Warwickshire Regiment, and is commemorated at the Le Touret Memorial, France. Julie is a lifelong supporter of West Bromwich Albion Football Club. Also appeared in The Taming of the Shrew, produced in Liverpool, England; and in Jumpers, Royal Exchange; performed with *Everyman Theatre, Liverpool and Bristol Old Vic. 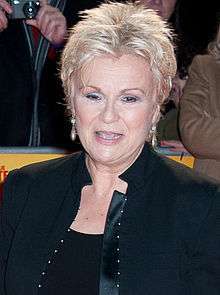 Julie Walters has won eight BAFTAs, six competitive awards plus two honorary awards. The first honorary award was a special BAFTA that she received at a tribute evening in 2003, before receiving the BAFTA Fellowship in 2014. In 2000, she was awarded the Dilys Powell Award for Excellence in Film by the UK Critics' Circle. She became an OBE in 1999 and CBE in 2008. ↑ Julie Walters. "That's Another Story: The Autobiography by Julie Walters — Reviews, Discussion, Bookclubs, Lists". Goodreads.com. Retrieved 2016-01-15. ↑ "St Chads Hospital". Bhamb14.co.uk. Retrieved 2016-01-15. ↑ Walters, Julie (2008). That's Another Story: The Autobiography. Weidenfeld & Nicolson, London. p. 2. ISBN 978-0-297-85206-3. ↑ Scott, Danny (3 September 2006). "Julia Walter". The Times. London. Retrieved 3 April 2010. ↑ Mottram, James (14 May 2001). "Julie Walters: An actress in her prime". The Guardian. London. Retrieved 3 April 2010. ↑ "Julie Walters Biography (1950-)". Filmreference.com. 1950-02-22. Retrieved 2016-01-15. ↑ Walters, Julie (2008). That's Another Story: The Autobiography. Orion Publishing Co. p. 1. ISBN 0-297-85206-X. ↑ "That's Another Story—Book Review". Retrieved 14 November 2009. ↑ Walters, Julie (2008). That's Another Story: The Autobiography. Orion Publishing Co. p. 100. ISBN 0-297-85206-X. ↑ Walters, Julie (2008). That's Another Story: The Autobiography. Orion Publishing Co. pp. 102–123. ISBN 0-297-85206-X. ↑ Nigel Farndale (25 March 2009). "Bill Nighy interview for The Boat That Rocked". The Daily Telegraph. UK. ↑ Saner, Emine (13 October 2006). "It was like being videoed making love". The Guardian. London. Retrieved 3 April 2010. ↑ Rachel Hore, Manhattan Transfer Archived 5 March 2016 at the Wayback Machine.. The Guardian, 14 October 2006. Retrieved 2 September 2013. ↑ Susan Jeffreys, Maggie's Tree, by Julie Walters Archived 30 August 2016 at the Wayback Machine.. The Independent, 13 October 2006. Retrieved 2 September 2013. ↑ Archived 6 September 2008 at the Wayback Machine. ↑ "Satellite Awards, 2008". International Press Academy. Retrieved 2 December 2016. ↑ Julie Walters on Walk of Stars (2009-10-27). 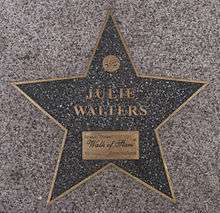 "Birmingham - People - Julie Walters on Walk of Stars". BBC. Retrieved 2016-01-15. ↑ "Julie Walters is transformed into Mo Mowlam for new film role". Daily Mail. UK. 4 June 2009. ↑ "Julie Walters tells of fear over Mo Mowlam role". BBC. 20 January 2010. ↑ "Julie Walters' dramatic portrayal of Mo Mowlam 'is Bafta-worthy'". The Belfast Telegraph. ↑ James Rampton (29 January 2010). "Observations: Just a Mo for Julie Walters". The Independent. UK. ↑ "Cast confirmed for BBC Two's cycle of Shakespeare films" (Press release). BBC Drama Publicity. 24 November 2011. Archived from the original on 30 December 2011. Retrieved 20 July 2012. ↑ "Over 50 Life Insurance TV advert | LV= Est. 1843". Lv.com. Retrieved 2016-01-15. ↑ "The Last of the Haussmans – Productions". National Theatre. Retrieved 13 June 2012. ↑ "Julie Walters is revealed as the new voice of LEXI". Channel 4. Retrieved 8 September 2016. ↑ "Beer, bunting and Julie Walters - village celebrates Diamond Jubilee with style". Telegraph. 2012-06-02. Retrieved 2016-01-15. ↑ 9.00pm-10.00pm (1970-01-01). "Who Do You Think You Are? Julie Walters - Media Centre". BBC. Retrieved 2016-01-15. ↑ "Julie Walters - Who Do You Think You Are - A popular actress with a very dramatic Irish ancestry and story of a tragic loss in the First World War". Thegenealogist.co.uk. Retrieved 2016-01-15. ↑ "28th Moscow International Film Festival (2006)". MIFF. Retrieved 21 April 2013.